So with Moses being the kind friend who volunteered giving up his Sunday lie in (Thanks to my other mates who said they would as well and a bit later sending that email reply Moe and you would have got away with it) we headed off to the start line of The 2018 greater Manchester Marathon. I had decided to do the marathon as my last long run for my training for The London marathon. Better pounding the streets of Manchester with a crowd than another soulless run around Liverpool. After a personal best (PB) in The Liverpool Half Marathon a few weeks ago training along with weight loss could not have gone any better. 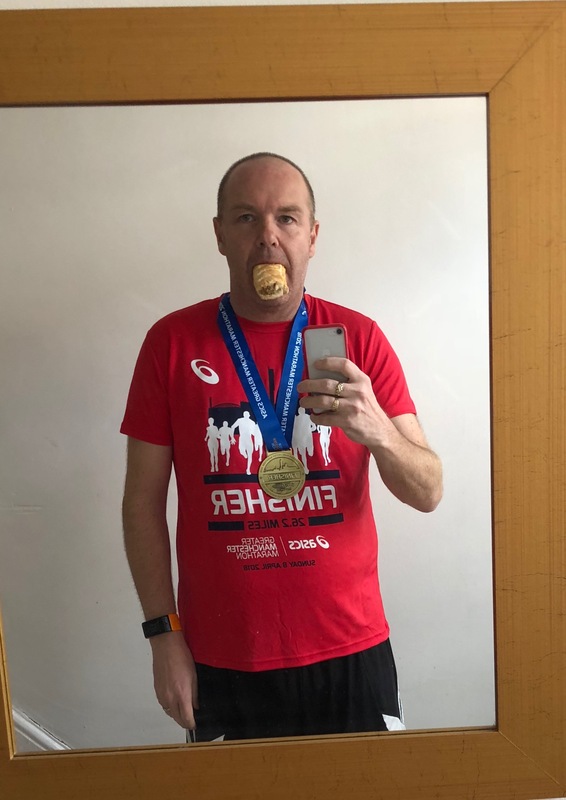 So this meant that The London Marathon challenge had grown out of control and ended up being a three marathons in seven weeks challenge with Liverpool tagged on after London. 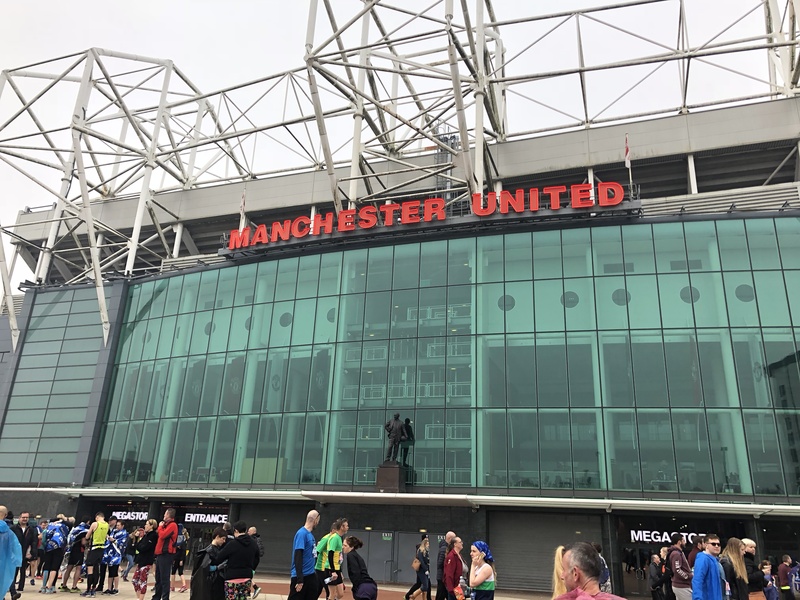 I arrived on enemy territory well in time avoiding the chaos of my previous Greater Manchester Marathon in 2016 and I arrived in kit so was all ready to start and took in a few sites by the start line as part of a warm up walk. Before I knew it there was just time for a pre race wee in the bushes a wee that you never need but to get that last dribble out makes getting to the start line in perfect condition a great feeling. That along with a cool and misty Manchester sky with the lightest of winds meant that running conditions were also prefect. So this year (Last marathon was Manchester 2016) I was armed with a GPS running watch to help pace myself and todays aim was to run a decent half marathon then plod onto 22 miles which I knew I could do having nailed that in training in Liverpool on Good Friday and then see how many more miles I could eeek out after that having in my two previous marathon attempts never ran one without stopping. So the first few miles around Trafford went well and made sure I didn’t start too fast looking at my watch. Running through Sale, Timperley and the half way point in Altrincham. Things were going great and I done 10k in 01:00:10 and the half marathon was done in 02:08:16. I must say the people of Greater Manchester really get into this marathon with loads of people en route cheering you on and some people making a day of it outside there houses giving out water and sweets. The people of Liverpool could take note of this and it really does help especially on those last few miles. I spotted Frank Sidebottom en route and also ran over The River Mersey at one point. 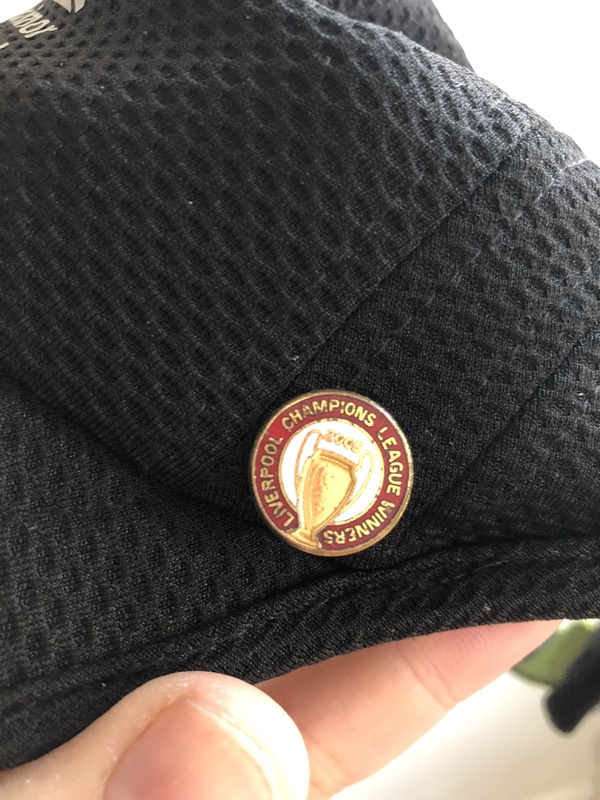 Being a scouser in Manchester I had to represent and had this on my running cap. So I eased down straight away at 13 miles ready for the second half of the slog. Around 16 miles there were a few people walking but I had done 22 in training and I was going to do more than that at the minimum despite the temptation to stop. Around 21 miles things were getting tough and mile times now around 11 min miles. At 22 I said “Right this is the furtherst I have ever run lets get to 23” at 23 miles I said “Just 3 miles and that is it” and ploughed on and my estimated time was going to be under 4 hours 30. I actually upped my pace for the last two miles. I wouldn’t quite call it a kick for home but mile 26 was run at 10:20 and with large crowds cheering me on I raised my arms as I crossed the line in 04:27:18 a PB beating 04:48:41 from 2016 at Manchester. Wow I had gone under 4 hours 30 and also ran a whole marathon without stopping. So the inspiration of this marathon challenge was to raise money for Millstead School as friends of mine have a daughter with Cerebral Palsy. As mentioned its grown out of all proportion from just a London marathon challenge to now three marathons in seven weeks. My original target of £500 was passed and I kid you not as I was writing this blog the new target of £1000 has been reached. I am truly overwhelmed by this as a person who has no workplace etc its an amazing effort from you all. 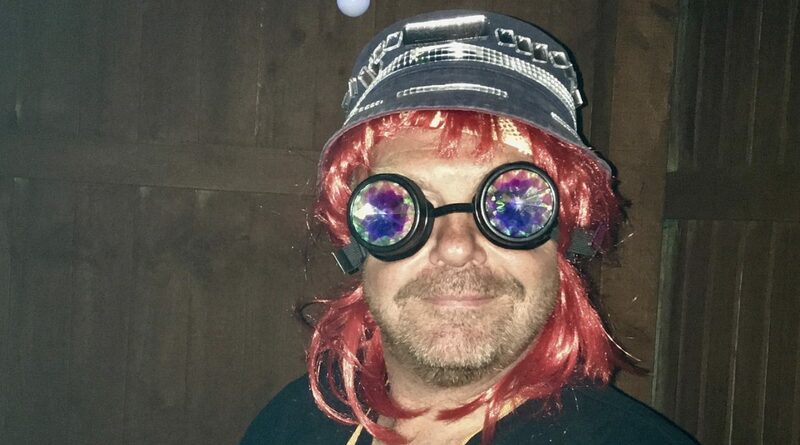 From Friends and Family to random followers on my Liverpool Weather Facebook and Twitter accounts to friends of friends I cant thank you enough. Link to my fundraising page below. So the next two marathons I am going to run a bit slower and enjoy. London should be good fun (As fun as 26.2 miles can be) and rather than having an eye on the watch trying to shave a couple of minutes off a daft PB I am going to take the London and Liverpool races in and enjoy. Having now ran a marathon without stopping and also going under 4 hours 30 I only have one ambition left in running. That is to fit comfortably into an XL t-shirt you get after you finish a race. The Manchester one below is the least snuggest yet but as you might see in the picture I think there is a reason my tops are tight. Not a bad run for a 16st piearse. Who knows I might even get to 15st something by the end of it all ? Now I have some energy back let the post race sausage roll and Desperados festival begin.